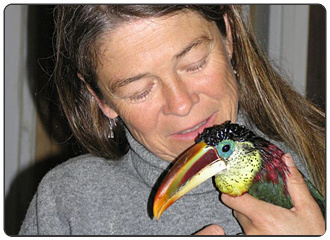 I just fell in love with this Curl Crested Aracari from Emerald Forest Bird Gardens. It is so friendly I could hardly believe it. I never realized toucans were so intelligent and entertaining until I visited to Emerald Forest. The variety of toucan species there was amazing and the facilities and grounds gorgeous. I am from Norway and I have traveled all over Europe and there is nothing in Europe like it. If you love birds, especially toucans, then you must visit this bird paradise.